The days of the Great Depression, in spite of the stalled economy, proved to be anything but a time devoid of happening, for times of unrest and discontent always seem to push men to action. One such action took place on the nation’s capital, during the summer of 1932; thousands of down-on-their-luck veterans of the Great War and their supporters marched on the capitol to demand the government pay their bonuses for their service in the war, which they were not scheduled to receive until 1945. Dubbed the “Bonus Army”, the protestors built up a Hooverville along the banks of the Anacostia river. The legislators debated how to respond to the veterans’ plea, but ultimately denied them their bonus. The Bonus Army’s struggle reached its climax on July 28, 1932, when a riot broke out, resulting in two men being shot and killed by police. In response, President Hoover called in the Army to “surround the affected area and clear it without delay,” so Chief of Staff General Douglas MacArthur commanded a contingent of five-hundred infantrymen and six tanks against the protestors, and, despite Hoover’s subsequent order to stop the assault, forced the veterans and their families out of the camp with tear gas, MacArthur claiming that the Bonus Army had been taken over by communists plotting to overthrow the federal government. The Bonus Army reconvened on Washington following Roosevelt’s inauguration in 1933, and the new administration provided more favorable results, compromising with the veterans by offering them jobs in the CCC, or a free ride back home. Most of them took the job. Needless to say, a sizable fraction of Americans were outraged by the attack on their own war veterans, and the media came out in support of the “forgotten man”, paying them tribute in films like Gold Diggers of 1933. On this record, the “Ukulele Ace” Johnny Marvin sings in a “citybilly” style what is most certainly the first song dedicated to the Bonus Army, and probably among the earliest American protest songs on record. 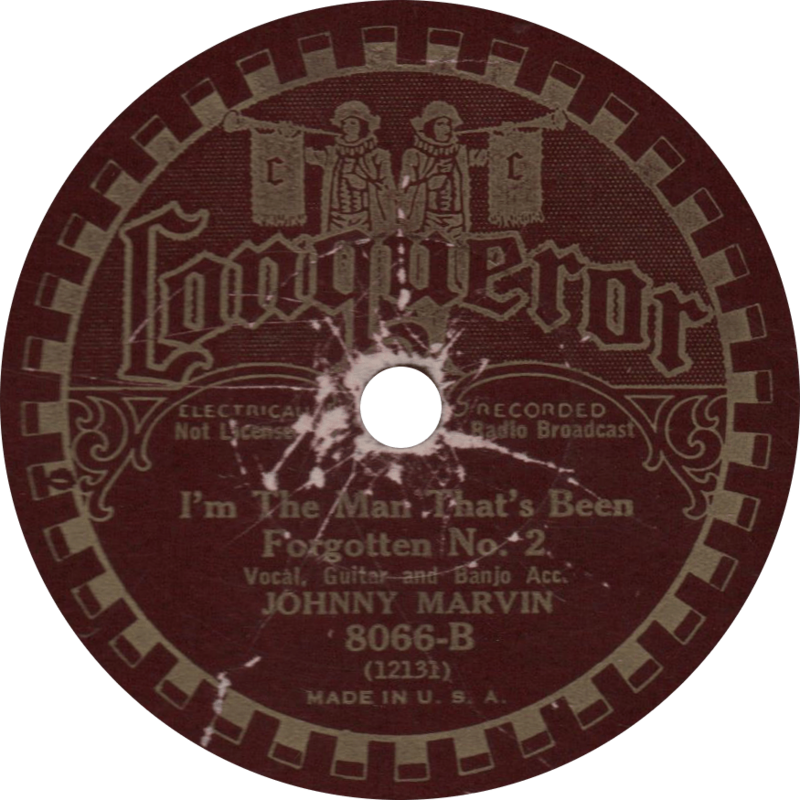 Conqueror 8066 was recorded in New York City on July 28, 1932—the very same day the Bonus Army conflict reached its climax—by Johnny Marvin, who accompanies himself on guitar. Roy Smeck plays steel guitar, switching to banjo on the “B” side. Johnny Marvin sings out in support of the dejected veterans on “I’m The Man That’s Been Forgotten No. 1” on the first side of this record. I’m the Man That’s Been Forgotten No. 1, recorded July 28, 1932 by Johnny Marvin. 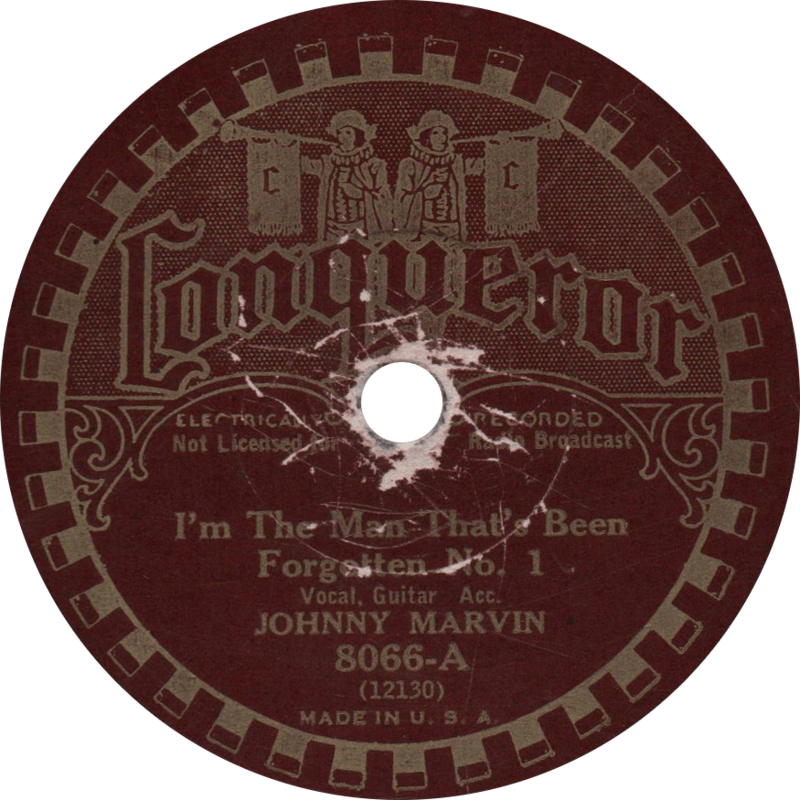 Marvin concludes his protest song on the reverse with “I’m the Man That’s Been Forgotten No. 2”. I’m the Man That’s Been Forgotten No. 2, recorded July 28, 1932 by Johnny Marvin. This entry was posted in Records and tagged 1930s, 1932, Citybilly, Conqueror, Great Depression, Hillbilly, Johnny Marvin, Protest Song, Roy Smeck, Topical Song by R. Connor Montgomery. Bookmark the permalink.